Adding a LIVE wedding painting to your ceremony or reception makes your day even more memorable to you and to your guests. A LIVE wedding painting is a one-of-a-kind wedding gift to yourself that can be shared with those you love in your happy years to come. Tesh is a professional artist based in Raleigh, North Carolina. 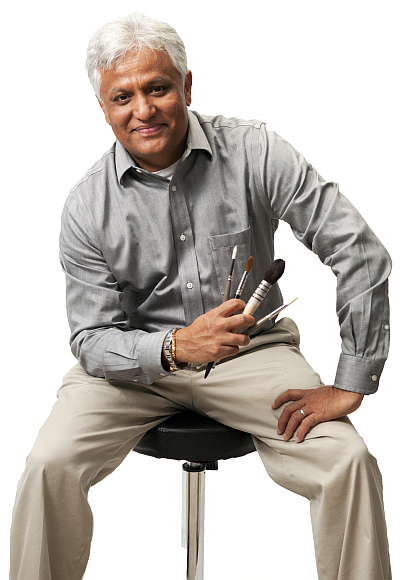 Originally from India, he came to the US in 1996 and found a love for painting weddings after meeting his wife, Mica. He is a student of Andrew Wyeth, Edward Hopper, and other famous artists who have dedicated their lives to creating beautiful pieces of art. He paints in both oil and watercolors, and is one of the very few artists to offer representational live paintings in watercolor! Tesh is available for LIVE wedding painting commissions worldwide. Having Tesh paint at your wedding is easier than you might think. He has been painting LIVE at weddings since 2009. When it comes to decision making for your paintings, he will guide you through the process with a refreshing ease that will make you ask yourself, “Why wasn’t Tesh the first person I called when I started planning my wedding!” Hiring Tesh for your wedding adds a level of elegance and novelty that no other vendor will be able to create. Tesh will set up out of the way, but not too far from you guests, so they can enjoy watching the painting come to life. Once the painting is complete, you and your partner will enjoy the unveiling of your finished piece, which symbolizes the love that you share together. Want something really spectacular that people will be talking about for a long time after your big day? Hiring Tesh to paint your wedding not only gives you a LIVE Painter at your wedding to capture the beauty of your love, but also gives your guests a little something more to look forward than lighting sparklers when you leave the reception. It is truly a unique service that not everyone is able to have, so make sure that you plan in advance for Tesh to be a part of your wedding day by sitting down to share your vision with him and booking him as soon as possible. Complete the contact us form to speak with Tesh about your upcoming wedding.